The White House announced today that the press secretary, Robert Gibbs, has joined Twitter! 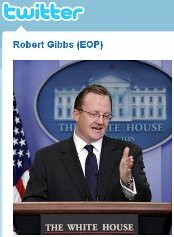 You can follow Robert Gibbs, and confirm his Twitter profile, at @PressSec. The press secretary has become very popular in the past 7 hours. He has acquired over 9,000 followers, and this number is growing very quickly. Gibbs told The Associated Press about opening his Twitter profile: “I opened it today. I was watching a twitter feed while the President visited the briefing room last week and it thought it was fascinating to watch and see what people were thinking, doing and writing.” He was referring to Obama visiting the press room Tuesday after a bipartisan meeting with members of Congress.